Collette from Tomopop unboxes a Magic Love Hello Kitty figure we sent her! We are now sold out of this figure but you can find the accompanying Visell Bad Badtz Maru and Junkocat Chococat figures (also Sanrio x Kidrobot collaborative figures) at Tenacious Toys for $39.95 each. Basically, each 6-inch vinyl figure in this series is an artist's take on a Sanrio character. Pretty cool! Atomic Martians quite unexpectedly offers up a preview of our upcoming Zombie Chuck resin figure exclusive (starts at about 8:15 in the video). In case you missed our last blog post about this, Brian Fyffe poured us an exclusive blue run of his 5-inch Zombie Chuck figure. This will be the first of several figures Brian will be pouring, all based on characters from his Zombie Chuck comic. They are in transit on the way to us now and they'll be selling for $15 each. Stay tuned for more info! Thanks to Atomic Martians for being awesome! During Nuggs' hustle he encounters many species, either wanting his crop or wanting his flesh. In this fight for survival you never know what's gonna pop up. Lets just be happy that Nuggs got away from this one. 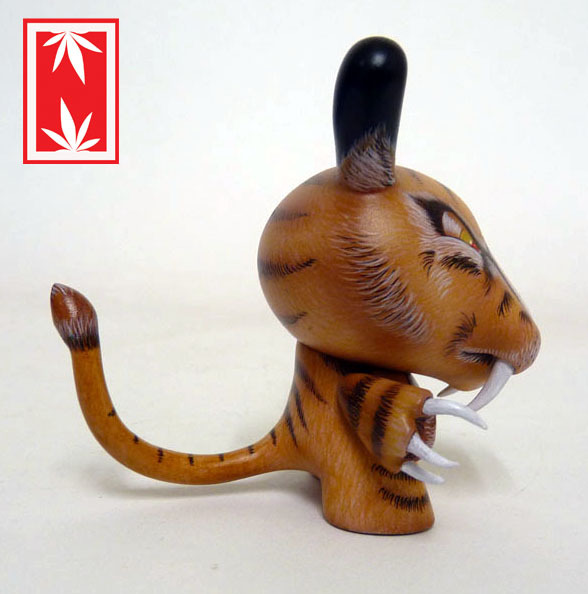 "Sabertooth" custom 3-inch Dunny by Ian Ziobrowski, commissioned by a VERY lucky private collector. How is this level of detail even POSSIBLE on a 3-inch toy? I think Ian can shrink himself down to 3 inches tall to get those tiny brush strokes in. You should definitely follow Ian and his custom work here.